1 1. Earn the AY Cooking honor. 2 2. Give a brief history of Dutch ovens and their role in American history. 3 3. Know the difference between a bread oven, a stew/meat oven, pot/stove top oven and a camp oven. 4 4. In what way are ovens sized? 5 5. Know and demonstrate fire and Dutch oven handling safety and the proper use of equipment. 6 6. What types of fuels are used to cook with an oven? 7 7. What are the advantages of charcoal over wood as fuel? 8 8. How do you control temperature? 9 9. What do ashes do to the efficiency of the coals? 10 10. If using wood, what types are best for cooking? 11 11. Demonstrate how to properly season a new Dutch oven. 12 12. Demonstrate how to properly clean a Dutch oven after each use. 13 13. Demonstrate how to properly transport Dutch ovens. 14 14. Demonstrate how to properly store a Dutch oven for a short term and long term. 16 16. Cook with the lid only as a griddle. 17 17. Name the six different ways to cook in a Dutch oven. 18 18. What is meant by stack cooking? 1. Earn the AY Cooking honor. The answers for the Cooking honor can be found in the Household Arts section of this wikibook. 2. Give a brief history of Dutch ovens and their role in American history. The first Europeans coming to the Americas brought Dutch ovens with them, including Columbus, who had one listed on his manifest, and the Pilgrims who landed at Plymouth Rock. Dutch ovens were so highly prized in early American history, that Martha Washington has been said to have listed her Dutch ovens in her will. Lewis and Clark brought a Dutch oven with them on their overland expedition to the Pacific Ocean. The mountain men that followed them into the west used them for cooking and for trade with the Native Americans. Dutch ovens were also carried on the "chuck wagons" brought along on the cattle drives in the late 1800's. 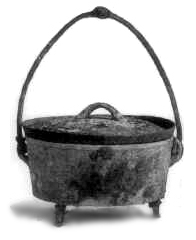 The Dutch oven shown here was owned by Mrs. Ott, of Petersburg, Illinois. It was featured in an article about Abraham Lincoln in McClure's Magazine in 1896. "These Dutch ovens were in many cases the only cooking utensils used by the early settlers. The meat, vegetable, or bread was put into the pot, which was then placed in a bed of coals, and coals heaped on the lid." 3. Know the difference between a bread oven, a stew/meat oven, pot/stove top oven and a camp oven. Bread ovens are four inches deep. They are more shallow than stew/meat ovens so that the heat from the lid will be closer to the bread. Stew/meat ovens are five to seven inches deep. Pot/stove-top ovens have no legs and are used on top of a stove. Camp ovens have long legs so that coals may be heaped beneath them. They also have flanged lids so that coals may be heaped on top of them. Camp ovens are used outdoors in campfires, and sometimes indoors in a fireplace. 4. In what way are ovens sized? 5. Know and demonstrate fire and Dutch oven handling safety and the proper use of equipment. Make sure you are dressed properly when handling Dutch ovens. A heavy apron, leather gloves, and shoes are essential. You should also have a fire extinguisher handy. Keep the area free from tripping hazards, and use lid lifters and lid stands. You will also need a shovel for moving the hot coals around. Check with local fire officials and get any required permits before building a campfire. Here is a good video on using a dutch oven. 6. What types of fuels are used to cook with an oven? 7. What are the advantages of charcoal over wood as fuel? Charcoal briquettes are uniform in size, and are made from a single species of wood. Because of this, they burn more evenly, and thus, they produce heat more evenly. Wood on the other hand, comes in non-uniform sizes, and the type usually used as firewood is often of more than one species. As a result, it does not heat as evenly as charcoal does. 8. How do you control temperature? The easiest way to control the temperature of a Dutch oven is by using the right number of charcoal briquettes for the desired temperature. In general, you should put one third of the total briquettes beneath the Dutch oven, and the remaining two-thirds on the lid. The number of briquettes required to achieve a temperature of 325°F (160°C) is twice the pot's diameter as measured in inches (or 8/10 times its diameter as measured in centimeters). So if you have a 12" (30 cm) pot, you will need 24 briquettes. Eight of them will go beneath the pot (one third of 24 is 8), and 16 go on the lid (two-thirds of 24 is 16). For higher temperatures, add three more briquettes - one to the bottom, two to the lid. Every time three briquettes are added, the temperature will increase by 25° to 30° F (14° to 16° C). Note that these numbers are only a rule-of-thumb. There are many other variables that can affect the temperature inside a Dutch oven, including the outside temperature, whether the oven is in the sun or shade, the amount of wind, and the amount of metal the oven is made from. You will need to experiment with your oven to master temperature control. 9. What do ashes do to the efficiency of the coals? Ash decreases the efficiency of the coals because it acts as an insulator. It should be brushed off with a small wisk broom often when cooking. 10. If using wood, what types are best for cooking? In general, hardwoods such as oak, hickory, ash, and mesquite are better than softwoods such as pine. Be careful when using mesquite though, as it burns very hot. Hardwoods also produce less smoke than softwoods, and softwoods are more likely to leave a creosote residue on the oven. 11. Demonstrate how to properly season a new Dutch oven. New Dutch ovens are often coated with wax, and this must be removed as the first step in seasoning it. To do this, wash the Dutch oven (and the lid!) using hot soapy water inside and out, and rinse it thoroughly, also in hot water. Dry the oven with a towel. Then wipe the entire oven down with cooking oil or shortening (use a high quality cooking oil such as olive oil or vegetable oil). Be sure the coat all surfaces of the oven, inside and out, including the lid and the legs. The next step is to "bake" your Dutch oven upside-down for an hour at 350°F (175°C). Put the lid on top of the Dutch oven's legs when doing this. A regular kitchen oven can be used, but be warned - this will fill your house with smoke! Open two windows - one in the kitchen, and one elsewhere. Put a fan on the kitchen window sill to blow the air out of the kitchen. It would be better (for the occupants of the house) to do this on an outdoor gas barbecue grill (the kind with a cover). After one hour, turn off the heat and let the oven cool. When it cools, it is ready to use. Do not cook any acidic foods (such as tomatoes) the first two or three times after seasoning the oven, as this may break down the baked-on oil coating. Some dutch ovens come preseasoned by the manufacturer. The makers claim the factory seasoning is superior to home seasoning. 12. Demonstrate how to properly clean a Dutch oven after each use. To clean the Dutch oven, simply wipe it down with a clean paper towel. If food is stuck to the oven, bring one or two cups of water to a boil in the oven and scrape the food off with a rubber spatula. Do not use soap, metal scouring pads, or metal utensils on a cast-iron Dutch oven or you will have to re-season it! It's OK to use soap on an aluminum Dutch oven. 13. Demonstrate how to properly transport Dutch ovens. Transport your Dutch oven in a cardboard box, a wooden crate, or in a carrying case to protect it from damage. 14. Demonstrate how to properly store a Dutch oven for a short term and long term. Use a paper towel to lightly coat the Dutch oven inside and out (including the legs and lid). Lay a single paper towel flat in the bottom of the oven. Fold a paper towel into a one-ich (2.5 cm) wide strip and place it on the rim of the Dutch oven to form a spacer so that the lid does not fit tightly. Be sure to use a whole paper towel. This is to allow air to circulate inside the oven and prevent the oil coating inside the oven from becoming rancid. If the coating does become rancid, you will need to strip it and re-season it. To strip an oven, place it upside-down in a self-cleaning kitchen oven with the lid placed on top of the legs. Set the kitchen oven on self clean for two hours. Do not cook food in a rancid oven, or you will end up with rancid-tasting food! Do not store the Dutch oven in a damp area. We include at least one recipe for each category here, but if you have a favorite, please feel free to add it. Spray the inside of the Dutch Oven and the underside of the lid with Cooking Spray. Peel the onion and slice it into small pieces. Cut up the bell pepper, discarding the core and the seeds. Melt the butter in the Dutch Oven and sauté the onion and pepper until the onion is transparent. Add the water, beans, tomatoes, hamburger substitute, and chili powder and stir well. Cover, and place the Dutch Oven on a bed of coals, or suspend on a tripod over a campfire. There is no need to put coals on the lid. Heat for about 30 minutes, stirring often. Combine the Cream of Mushroom Soup, Green Beans, Milk, Pepper, and half the French-fried Onions in the Dutch Oven. Mix well with a rubber spatula or wooden spoon (a rubber spatula also works well for getting all the soup out of the can). Bake for about 30 minutes at 350°F, rotating the lid and the oven every ten minutes. Remove the lid from the Dutch Oven and add the remaining French-fried Onions to the top of the casserole. Return the lid to the Dutch Oven and bake for an additional five minutes. Heat the milk until it forms a skim on the surface (it should not boil). Add the butter, salt, and sugar to the milk and mix with a whisk until the butter melts. In a mixing bowl, dissolve the yeast in the water (the water must be very warm). The whisk helps here too. Combine the milk mixture with the water, mix with the whisk. Add the flour to the liquid. Powder your hands with flour and mix the dough with your hands, or use a dough hook at low speed for one minute. As you mix the flour, it should just clean off the sides of the mixing bowl. Add more water or more flour to get the dough to the right consistency. It works best if the dough is just dry enough to handle with floured hands. If using a dough hook, knead for two more minutes at the next speed level. Otherwise, sprinkle flour the the work surface, dump the dough ball onto it and knead vigorously for five minutes. Kneading is done by folding the dough in half, flattening, rotating 90°, and repeating over and over again. Grease the mixing bowl with cooking spray. Form the dough into a large ball and return it to the mixing bowl, smooth side down. Turn the dough ball over until all sides are coated with the cooking spray. Leave the smooth side up. Cover the dough in the mixing bowl with cellophane. Allow dough to rise for about an hour. It should double in size. Dump the dough ball onto a clean work surface, flatten, and cut in half. Refrigerate one half, or bake both halves in two Dutch ovens. Place the dough ball in the Dutch Oven, smooth side up and centered. The sides of the dough ball should not touch the sides of the oven. Bake at 375°F for 25 to 30 minutes. Spread butter on the top surface of the loaf and allow it to cool five minutes before cutting. Pour the peaches (syrup and all) into the dutch oven. Place pats of butter on top of the cake mix. Cover, and bake for about 30 minutes at 350°F. 16. Cook with the lid only as a griddle. The lid can be used as a griddle if it is turned upside-down and placed on a heat source. The advantage of this technique is that the lid is slightly bowl-shaped, so even if it is not perfectly level, whatever you are cooking (pancakes anyone?) tends to stay in the griddle instead of spilling out. 17. Name the six different ways to cook in a Dutch oven. You can use a Dutch oven for frying, deep frying, baking, boiling, stewing, and roasting. 18. What is meant by stack cooking? Stack cooking is the practice of stacking up to four Dutch ovens one on top of another, and cooking a different item in each one. This conserves fuel, but one must be very careful to not overturn the stack or all of the food will be ruined. A disadvantage of stack cooking is that if the bottom oven needs to be checked, all the ones on top of it must be moved first. In non-stack Dutch oven cooking, it is normal to rotate the oven every 10 to 15 minutes so that the heat is evenly distributed. However, this is not practical in stack cooking. Instead, it suffices to simply move the coals around on each layer. This page was last modified on 30 July 2015, at 22:44.